Foursquare’s been making a serious effort to develop its daily deals platform partnering with the likes of LivingSocial, Gilt, and Amex. Now, it can add the veteran coupon curator of them all to that list. 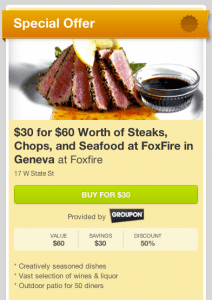 Today Groupon announced it would be partnering with Foursquare, and its Groupon Now deals will be available when you use Foursquare to check-in. “As you get out and explore your city, just peruse participating Groupon merchants on Foursquare, from lunch spots to live events, and purchase your Now! deal to apply immediately to your purchase,” it explains. Daily deals will also be viewable when you use Foursquare. Months ago, we heard that the two big purveyors of local commerce were working on integrating, which would be a big coup for Groupon. It would give the daily deals service a new way to reach users outside its current model, and Foursquare’s massively growing userbase is no small territory to invade. The Groupon phenomenon has come under serious scrutiny recently as vendors have tired of the operation and its potential fallout has become common knowledge. Consumers have slightly soured toward the site as well, given the oversaturation in the daily deals market and some general disillusion with the process. But the Groupon Now application could easily give the site a boost, offering deals in real time based on users’ locations. Pairing it with Foursquare, despite some of the competition between these two companies, will likely skyrocket its use.